I am happy to have received an endorsement from Josh Rimany. Josh is a past President of the Dilworth Neighborhood Association and is the owner pharmacist at Dilworth Drug & Wellness Center. He and his wife have dedicated many hours to preserving and protecting historic Dilworth and understand the many challenges faced in neighborhoods throughout District One. I am honored to have his endorsement. I fully endorse Patsy Kinsey for re-election to city council. Patsy has been a steward to our communities in District 1 and all of Charlotte for many years. 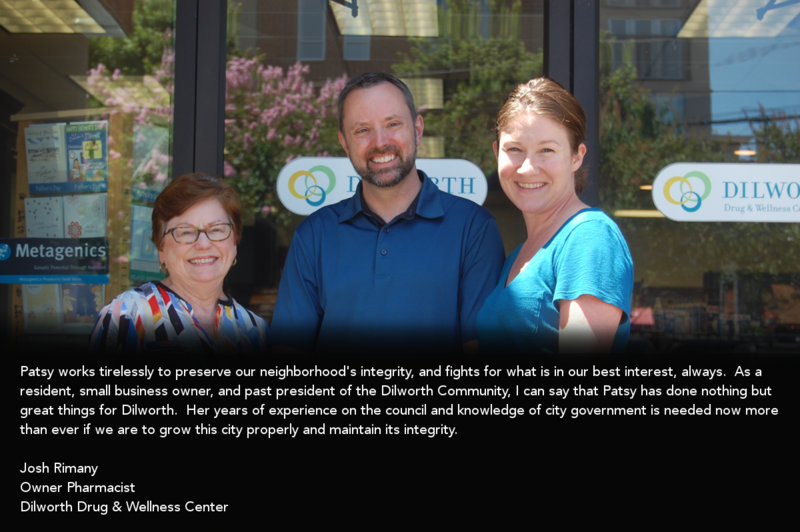 She works tirelessly to preserve our neighborhoods’ integrity, and fights for what is in our best interest, always. As a resident, small business owner, and past president of the Dilworth Community, Patsy has done nothing but great things for Dilworth. Her years of experience on the council and knowledge of city government is needed now more than ever if we are to grow this city properly and maintain its integrity.